t was the late 1980s and high atop the Himalayas, heavy snow hurling its way down from the skies, a small group of breeders began to cross-breed marijuana strains carefully selected from every corner of the Middle East and Asia. Bountiful harvests of Sativa and Indica cultivars kept the group's spirits up during a 3 year stint in the rural, desolate mountains. One member of this talented group would go on to create one of the most prominent cannabis seed production businesses in the world. That business is Barney's Farm and the man who started it all is Derry. Bad Azz Kush is a strain which was created by breeding a true Indica which is rich in history dating back to ’98 in Los Angeles. Bad Azz originally started life from specially selected breeding by our friends in L.A. over years of careful and persistent work. By crossing the Original OG with Afghan Kush and from there crossing it with Urkel, Bad Azz Kush was born. The plant can stretch in the flowering period and will need some space for enormous colas to develop. This is a heavy resin producing strain with enticing and unique dank and subtle forest fruit aromas. We owe a special thank you to our friend and rapper Bad Azz from Tha Dogg Pound Gangsta Crips. This wonderful blend of genetics creates a high yielding, short flowering Indica dominant hybrid that grows up to 100cm tall indoors. The flowering time is only 8.5 weeks which will have heavy side branches that need support in their final flowering stage. Chronic Thunder produces a relaxing, satisfied high with a unique dried cinnamon fragrance and delicious flavor. Honey B is the resulting product of a lengthy selection process, where we stabilised this Sativa monster. The plant has a high yield that produces a mass of large, tasty colas. The plant will stretch up to 150cm in its 10-11 week flowering time, where the resins and flavours will develop. The side branches will need supporting in the final two weeks, but give this plant time and space and it will produce a huge amount of Sativa which offers a clear, racy and long lasting high. This is a strain for the true Sativa connoisseur. Preferred Indoor: 600 g/m2 . 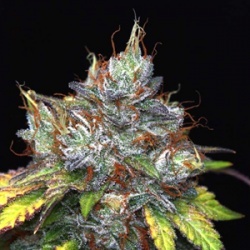 Morning Glory is the result of a three way strain cross, a combination of Afghani Indica with Hawaiian and Skunk #1. The Hawaiian is important as we succeeded to blend the citrus flavours of the East Coast with Kush effect of the Afghani and the cerebral high of Skunk #1. It has the mouth-watering taste of forest fruits. This is a vigorous plant, needing only two weeks in vegetation. It then takes a further 8-9 weeks of flowering to produce an excellent yield of between 550—650 grams per m² indoors. The plant thrives in greenhouses, yielding over 2 kilos per plant in ideal outdoor conditions. 1st place Cannabis Cup (HTCC) 2002.